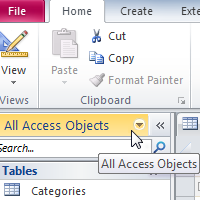 While there are four types of database objects in Access 2010, tables are arguably the most important. Even when you're using forms, queries, and reports, you're still working with tables, since that's where all your data is stored. Tables are at the heart of any database, so it's important to understand how to use them. In this lesson, you will learn how to open tables, create and edit records, and modify the appearance of your table to make it easier to view and work with.